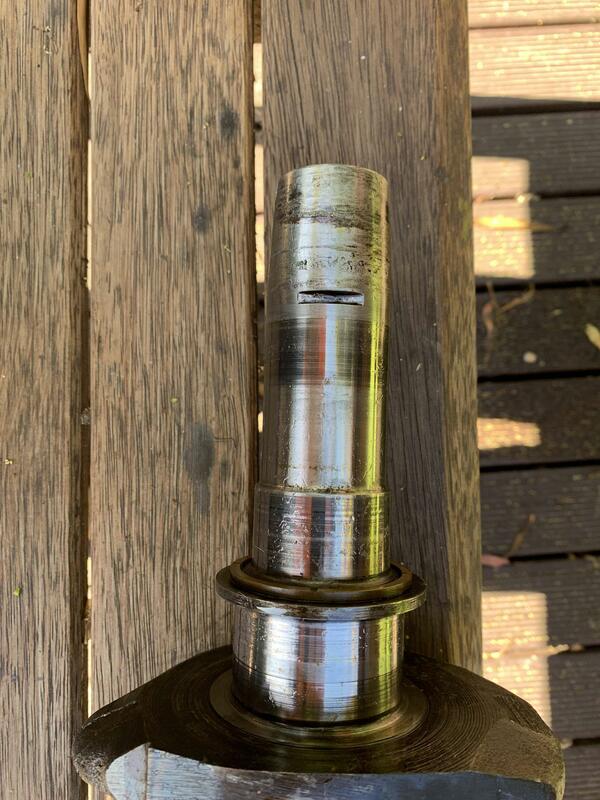 Crankshaft Taper Appears To Have Significant Fretting, Any Idea If It Can Be Salvaged? I'm about to rebuild what I believe to be an early A-Plus 1275 motor and have noticed after taking the crankshaft out that the end appears to have what I think is signs of pretty bad fretting and was hoping to get some opinions on whether it can be salvaged or not. From what I've read carefully filing high points and lapping on the new flywheel can often salvage this sort of damage but just wanted check opinions on if maybe it's too far gone before I spend the money to have it machined undersize. It doesn't look too good, but it's hard to tell from a photo. You can't machine it undersize because the taper determines the longitudinal position of the flywheel which is critical for clutch position. If machined, the flywheel will go on too far and possibly also hit the casing. Best thing is to clean it up with emory cloth, then try to lap the flywheel on and see what sort of contact area you get. Consult your machine shop if in doubt. What would be the consequences of using it like that? I'm interested to learn. I agree with Cooperman that it's a bit hard to tell for sure from the photo, but I actually feel it looks much worse than it is. I'm inclined to say that would clean up and be fine. I wouldn't recommend a file for any of the high spots, but a 600 grit Diamond Lap. Lap the flywheel in to the taper (with fine lapping paste). For most use, as long at it has around 70% contact with reasonable contact it the small and big ends of the taper, it'll be fine, but when fitting, use a light oil (3 in 1 is good) on the taper, just the smallest lick, and tighten the bolt up as tight as you can get it. It will end up being on very tight doing it this way, so it won't fret, BUT be warned, you'll need a very good flywheel puller to remove it. This does happen quite often, too often. Start with a wire brush in a drill to remove anything that could be loose on the surface. Clamp the crank vertically and spin the flywheel for a minute, using the finest grit grinding paste. This should be enough to see the contact patches and enable you to make a better assessment. I have found that although coarse past cuts quicker, you then have to polish out those scratches. From fitting "alien" clutch covers, and having to adjust the thrust bearing, there can be a good 1/8" difference in how far a flywheel fits over the crank. It is sods law that your crank will "come up short", but you might be lucky. Is the correct lapping paste to use the same as is used for lapping valves in or something totally different?